Once generated by the air compressor, (compressed) air often must be further filtered so as to meet the exacting needs of the industrial applications for which it is used. This is most effectively done through the use of a downstream coalescing filter, or series of filters. It is a common misconception that “oil free” air compressors do not require this precaution. However, atmospheric air typically contains a significant amount of water, oil vapor and other contaminants, especially in industrial areas. Upon compression therefore, these contaminants are concentrated into the compressed air, whether the machine is “oil free” or oil flooded. The use of fine, coalescing filters is essential for both types of compressors, so as to prevent an accumulation of such contaminants in pneumatic machinery. J.C. MASTER coalescing filters are the simple way to avoid such contamination in your expensive equipment. 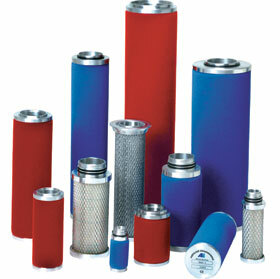 Our filters provide the highest level of clean, compressed air with a minimum loss of energy (pressure drop). Through the selection of the appropriate grade of borosilicate microglass filtration media, and maintaining the quantity, diameter and direction of individual fibers, J.C. MASTER coalescing filters guarantees your air compressor system will operate correctly with minimal operational upkeep.